Kosumalli is a traditional dish of south Indian Iyer family. In my mom's place, they don't make kosumalli, but in my in-laws place, it is necessary to make kosumalli during any occasion. Here is the recipe for kosumalli. Asafoetida powder - a pinch. Soak moong dhall for an hour in water. Drain it fully after an hour. 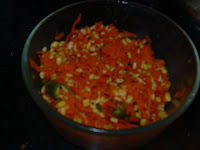 Now mix it with the shredded carrots. Add green chillies, salt and lemon juice to it. Mix it well. Pre heat oil, splutter mustard seeds, fry asafoetida powder and pour it on top of carrot mixture. Garnish it with coriander leaves. This is Carrot Kosumalli. This is made in Maharashtra also..called Koshimbir. Yours looks nice. We make this very often..Sometimes I omit adding moong dal and still tastes excellent..
Tomato Dosai and a TAG!! !